A dog found a large chunk of meat and decides to carry it back to its home it its mouth. On the way, the dog has to pass through a bridge. Beneath the bridge is a running stream of river. As the dog cross the bridge, it looks down beneath the bridge, and it saw another dog also carrying a large chunk of meat in its mouth. Actually, it is the dog’s own reflection in the river. 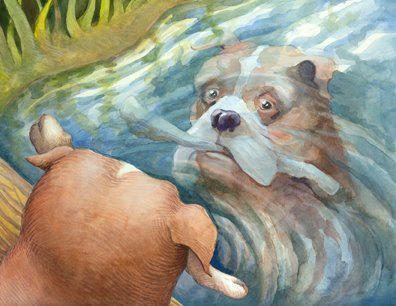 The dog became greedy and he also wants the large chunk of meat that the other dog in the water has in its mouth. So the dog decides to snarls at the shadow in the river. The dog opens its mouth and there goes the meat from its mouth into the water. The large chunk of meat sank into the bottom of the river and is never seen anymore. Always think carefully and made a wise decision and don’t let your sinful nature controls you.